CSS Weekly is a weekly newsletter that contains a list of the best and newest articles related to CSS and front-end development. Our audience is consisted entirely of passionate front-end developers. 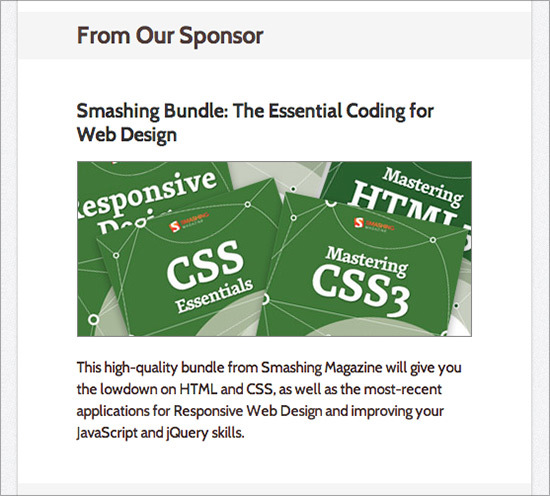 Your sponsorship will be featured prominently in the top half of the newsletter. You will get a dedicated brief section, including a title, description, call to action, and a 400px wide image for your company/product. 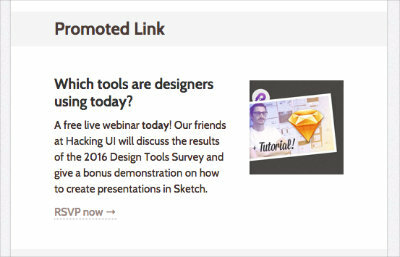 Your Promoted Link will be featured in the bottom half of the newsletter, after the Articles & Tutorials section. You will get a dedicated brief spot, including a title, description, call to action, and an image. Every newsletter is also published on the website with 500 RSS subscribers and promoted to our 9,207 Twitter followers and 2,262 Facebook fans. If you have any additional questions, please use our contact page. We'll be more than happy to hear from you. You get a discount for bulk orders, and you can spread out ads over time, they don't have to run in consecutive issues.